Just in time for New Year's. We all know about the Subway sandwich diet, featuring the ubiquitous Jerrod Fogle. Then I recently blogged about the cookie diet. With the cookie diet, you eat 4-6 specially prepared cookies a day and magically lose the weight you want. Too bad the cookies aren't Mrs. Field's white chocolate with macadamia nuts. Now comes two more diets making the rounds. Both diets seem extremely far fetched and each is gross in its own way. First there is the Taco Bell Drive-Thru diet. Here a woman named Christine claims in the Taco Bell commercials that she lost 54 pounds in two years e ating food from the fast food joint (I hesitate to call it a restaurant). The monotony of it alone would bore my tongue to death and cause me to lose weight. Then there is the even more extreme tapeworm diet. Featured in an episode of the Tyra Banks Show, this is a very pathologic way of losing weight. Tapeworms have troubled mankind for all of history. 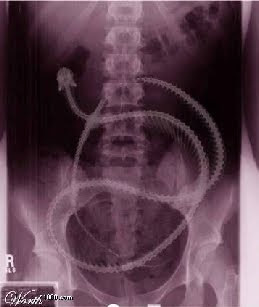 Millions have probably died from malnutrition, bowel obstruction, and other ailments because of the tapeworm. And now people are willingly ingesting the worm's eggs in order to take off the pounds. Yew!